PaintCare Inc. For Manufacturers - PaintCare Inc. Paint manufacturers that sell paint directly or indirectly in a PaintCare state are required by each state’s paint stewardship law to register their company and brands with PaintCare. Registration is a two-step process. 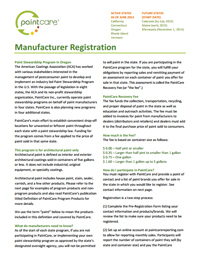 Manufacturer Fact Sheet Read this for an overview of the responsibilities of manufacturers. 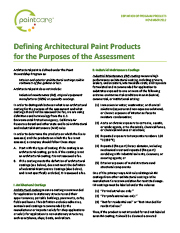 Definition of PaintCare Products Read this for an explanation of how to determine which architectural paint products need to be registered. You can register by going to www.paintcarereporting.org. During the online registration process, you list your company contact information, brands, and check a box for each state in which you would like to register. After we review your brands list to determine which ones are PaintCare program products, you will receive an email that a user profile has been created. Your company name and brands will be added to the official registration lists for each state you register. You can easily add other states by checking a box. The same brand list is used in all states. Remitter Agreements move the reporting and fee remittance responsibility to the dealer. 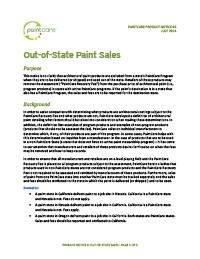 PaintCare will accept PaintCare Fees and reporting information from distributors or retailers selling paint in the individual states on behalf of their Manufacturer supplier(s). This arrangement is established by the parties entering into an agreement. Remitter Agreements are used between manufacturers and their distributors as well as between manufacturers and retailers and between distributors and retailers. Agreements can be used for all or part of a manufacturer’s sales. While Remitter Agreements benefit manufacturers by passing the reporting and remittance task to their dealer, there is also an economic benefit to the dealer – payment (remittance) of the fees occurs after the sale, rather than before. As of June 22, 2015, remitter agreements can be made between companies that have set up accounts to use PaintCare’s reporting system at www.paintcarereporting.org. If you do not have an account but would like to review the language of the remitter agreement, please contact Taujuana Davis at tdavis@paint.org or click here. Here are three scenarios to provide examples of how Remitter Agreements may be used: Scenario 1. Manufacturer sells and ships to its own company-owned in-state Retailer. The Manufacturer also sells to an out-of-state Distributor. For sales to its own stores, the manufacturer knows sales and reports and pays fees on these quantities. For sales to the distributor, the manufacturer does not know sales into the State; manufacturer may have distributor report and pay fees on these sales as long as distributor agrees to sign a Remitter Agreement and report and pay fees on behalf of manufacturer and to be subject to audit. Scenario 2. Manufacturer sells directly to in-state Retailer and in-state Distributor. For direct sales to retailer, manufacturer knows sales and reports and pays fees on these quantities. For sales to distributor, manufacturer does not know if all sales remain in the State (distributor may sell some to out of state); manufacturer may have distributor report and pay fees as long as distributor agrees to sign a Remitter Agreement and report and pay fees on behalf of manufacturer and to be subject to audit. Scenario 3. Manufacturer sells to out-of-state Distributor. Next, the Distributor sells to in-state Retailer. Manufacturer does not know sales into the State; manufacturer may either (a) report and pay fees on all sales based on shipments to distributor or (b) not report and pay fees and have distributor report and pay fees on these sales into State as long as distributor agrees to sign a Remitter Agreement and report and pay fees on behalf of manufacturer and to be subject to audit. Neither manufacturer nor distributor needs to report or remits fees as long as retailer agrees to sign a remitter agreement and report and pay fees on behalf of manufacturer and to be subject to audit. Can I Sign Multiple Remitter Agreements? Yes, as a manufacturer, you can sign Remitter Agreements with more than one dealer. Likewise, distributors may sign Remitter Agreements with more than one manufacturer and/or retailer. Retailers may also sign Remitter Agreements with more than one supplier (manufacturer or distributor), and often, a supplier will provide program products from multiple manufacturers. Separate agreements are required for each state. How do I Report Sales? A separate report is required for each state. If you are remitting on behalf of someone else, you will only be required to report sales in the aggregate, regardless of how many parties you are reporting for. For all of the sales into an individual state, you will report your total unit sales (by container size category) monthly, after the Program begins. Reports are due by the end of the following month and will be filed using a web-based, secure reporting system. What are my Obligations as a Remitter? In addition to reporting sales and paying the associated PaintCare Fee, the program will conduct compliance reviews. Fees will be required on any unreported sales. Remitters who do not appear to be acting in good faith are subject to expulsion from the Program. The definition of architectural coatings (also referred to as architectural paint or program products) is based on the first document below. The types of products that have fees are the same as those that are accepted at PaintCare drop-off sites. When clarification is needed about which products are subject to the PaintCare Fee and which products are not, PaintCare publishes additional notices. So far we have published seven notices, and we will publish additional notices as needed or upon request. 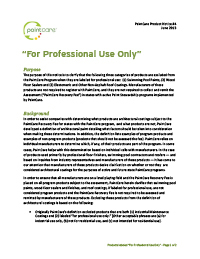 PaintCare Products Defined This document defines and gives examples of “PaintCare products” vs. “non-PaintCare” products to help manufacturers determine whether their products are covered by the paint stewardship program and whether the assessment (PaintCare Fee) should be applied. Product Notice 1. 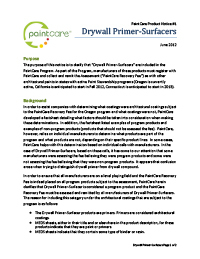 Drywall Primer Surfacers These products are used by drywall installers as the last coat to replace the so called “5th coat” and achieve a “Level 5 finish” This notices explains that these primers are part of the PaintCare program. Product Notice 2. 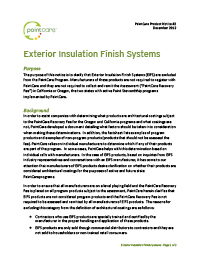 Exterior Insulation Finish Systems This notice explains that Exterior Insulation Finishing Systems (EIFS) are excluded from PaintCare. They systems are comprised of several components, including stucco-like products. Product Notice 3. 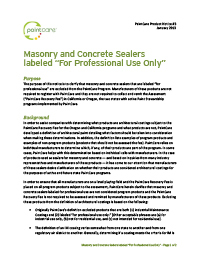 Masonry and Concrete Sealers labeled “For Professional Use Only” This notice explains that masonry and concrete sealers may be excluded from the PaintCare program and classified as an industrial coating if the label is worded with very specific phrases. Product Notice 4. Pool, Floor, Roof Coatings for “Professional Use” This notice is similar to #3 and excludes swimming pool paints, roof coatings and floor finishes used by professionals if the label is worded with very specific phrases. Product Notice 5. 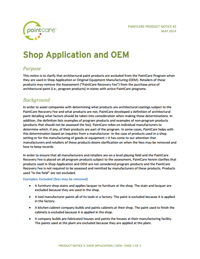 OEM and Shop Application This notice clarifies that products used in a factory or shop setting may be excluded, but products used in the field may not be excluded. These exclusions, based on usage, require record-keeping and documentation subject to audit. Product Notice 6. Out of State Sales This notice clarifies that fees do not apply to products delivered to a non-PaintCare state or being shipped to another country. Product Notice 7. Furniture Polishes, Waxes and Oils This notice clarifies that furniture polishes, waxes, and oils, such as linseed, tung, and lemon oil, are excluded from the PaintCare program. 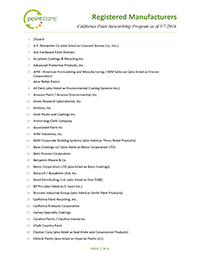 PaintCare publishes registration lists of manufacturers and brands for each state here. Lists are updated within 30 days of any change. 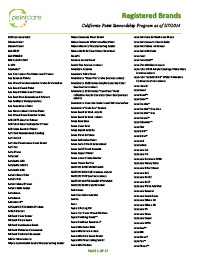 Retailers use these lists to check that they are only selling registered architectural coatings. To view a registration list, click on the name of the corresponding state. If you are a manufacturer that has just registered, please let us know if you would like us to update lists sooner than 30 days so that the retailers or others can see that you have registered your brands. Contact: Taujuana Davis at (202) 232-2733, tdavis@paint.org.